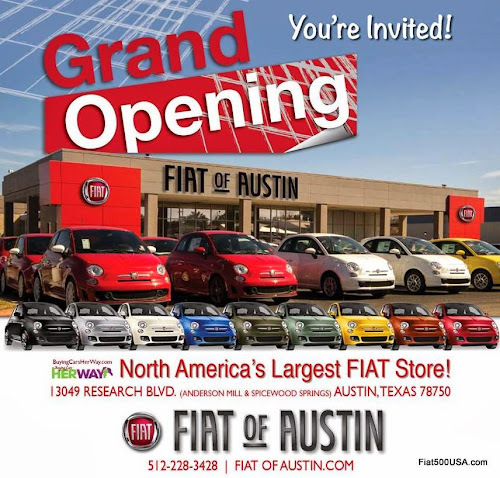 Our friends at FIAT of Austin, Texas celebrated their grand opening of their new facility this past Thursday. FIAT of Austin holds the distinction of being the top Fiat Studio in the country, selling 2,237 cars since its opening in February 2011. The dealership celebrated the opening of their new larger location with a grand opening event that featured the unveiling of four artist-painted Fiat 500 models. Lisa Copeland, the General Manager of FIAT of Austin is a passionate Fiat supporter and has championed the brand since its early days. Her enthusiasm and energy are contagious and it is easy to see why her team has achieved such outstanding results. We would like to take this time to congratulate Copeland and her staff at FIAT of Austin for their accomplishments and wish them the very best luck in their new facility. March 20, 2014 , Austin, Texas - FIAT of Austin, the sales leader since the FIAT brand was reintroduced to the U.S. market in 2011, has moved to bigger and better quarters. FIAT of Austin now is located at 13040 U.S. 183 North, about five miles north of its original location in The Domain shopping mall. The new FIAT studio is throwing a grand opening celebration today featuring a special reveal of four artist-painted FIAT models. The new FIAT of Austin location, along bustling U.S. 183 on the north side of the city, will become an art gallery showcasing the four hand-painted vehicles. Austin artist Sue Ellen Stavrand, who owns Art Driven, purchased three Fiat 500s and a Fiat 500L, and commissioned local Austin artist Cindy Raschke to use the vehicles as her canvas. These four unique vehicles will be revealed for the first time during today's grand opening celebration . Art Driven partners with the nation’s best artists to custom design and hand-paint automobiles. Since opening in February 2011, FIAT of Austin has sold 2,237 units. That’s more units sold than any FIAT studio in the country. In addition, FIAT of Austin was the first FIAT studio to sell more than 100 Fiat 500s in a given month, a milestone that earned the studio a personal visit from Chrysler Group LLC Chairman and CEO Sergio Marchionne. FIAT of Austin accomplished that sales feat in April 2012 when it sold 110 units. In its original location in The Domain, FIAT of Austin was right at home amid the mall’s upscale collection of boutiques. But the studio needed room to grow. In its new digs, FIAT of Austin now has a state-of-the-art facility and 29,000 square feet, up from the restrictive 6,000 square feet at The Domain. Service and parts are now provided at the new location, and there is ample space for inventory. FIAT of Austin is a member of the Nyle Maxwell Family of Dealerships. At its new location on U.S. 183, more than 165,000 vehicles a day pass by the new studio, a far cry from 650 at the original location. FIAT of Austin is hiring up to 30 additional sales and service staff at its new location. 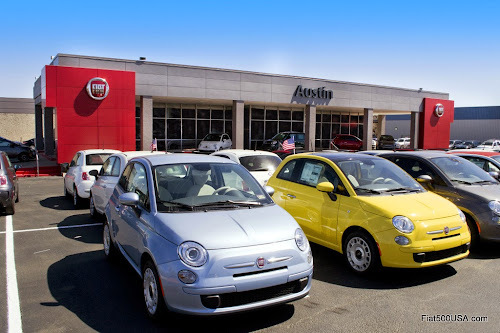 FIAT of Austin was named by Automotive News as one of the “Best Dealerships To Work For” in 2013,” a title that Copeland has no intention of relinquishing in her new home. Copeland has set an ambitious goal of selling 1,200 units this year, up from 737 units in 2013, and 937 units sold in 2012, which was best in the nation.